Converting a building that was never designed for human habitation into an attractive home can be a rewarding challenge. 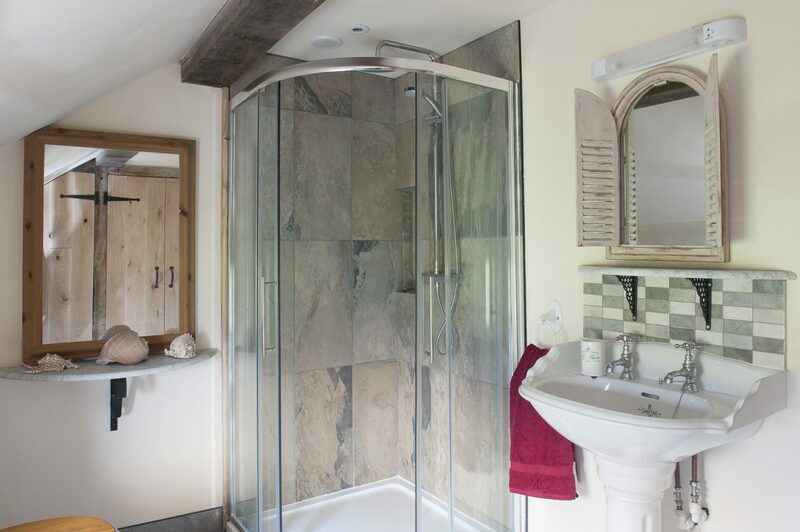 Oasts, barns, coach houses, urban industrial or commercial buildings – all have proved popular with architects and their clients and have resulted in a host of successful projects. 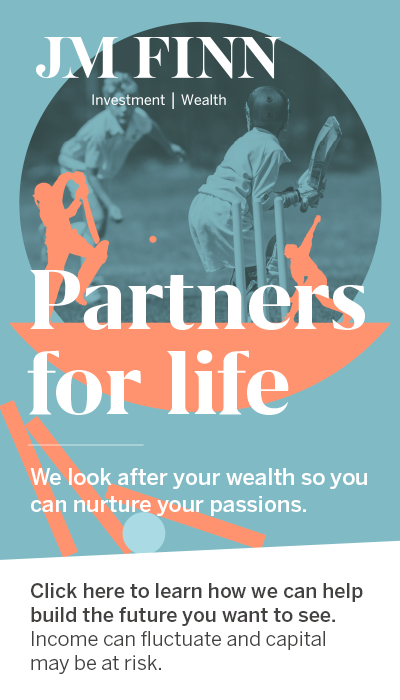 The reason is, of course, simple – they bring to the party one or both of two huge benefits, charm and space. 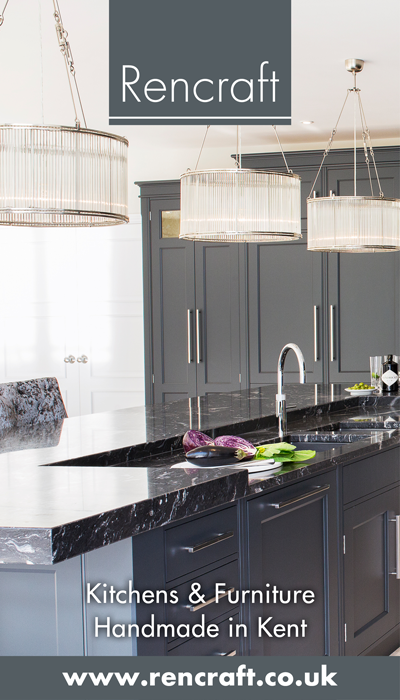 From there, the quality of the finished article is just a matter of imagination and commitment. However, what if the building you’re starting with has neither space nor charm? 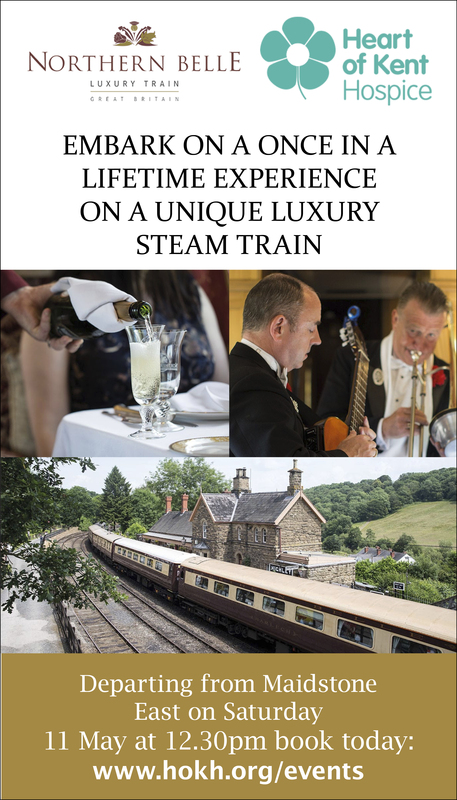 What if it has none of the romance of an oast or coach house, none of the generous spaces of an old cotton mill? What if it’s merely a half-finished triple garage? Then, I would suggest, you are going to need a little more than imagination. You are going to need, quite simply, a serious helping hand from the gods. 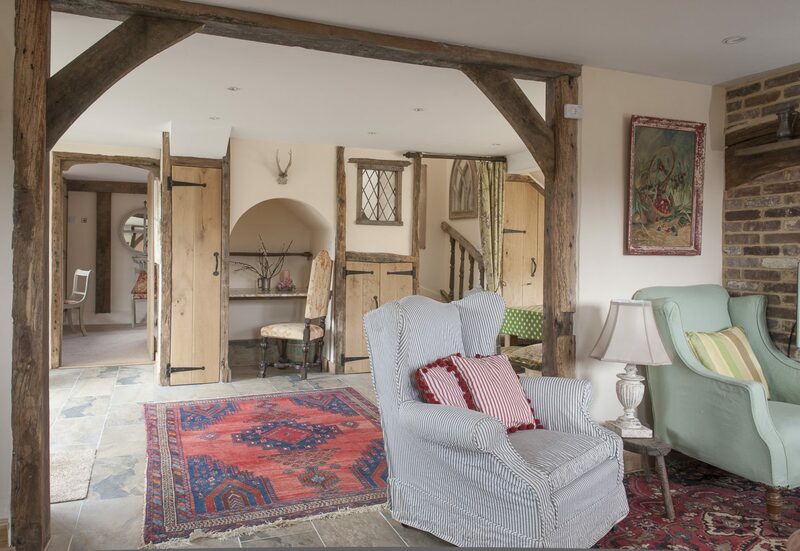 Which is just as well that the driving force behind the conversion of just such a building in Wittersham was Caroline Everett, whose barn conversion we featured several years ago in Wealden Times – a conversion that was, for my money, truly inspired. Caroline’s plan was to convert her garage not just into a comfortable annexe for passing friends but into a holiday home that would have guests returning time and again. “The idea was to create something that my husband and I would ourselves not only be happy to stay in but actually live in,” says Caroline. This was to be somewhere that was, in fact, not only a holiday home but a proper home. 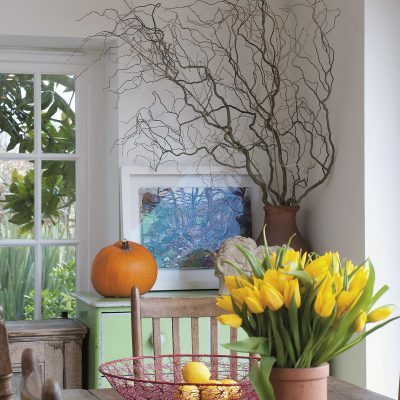 It certainly does with the sitting room now a stunning space with, believe it or not, a terrific inglenook. 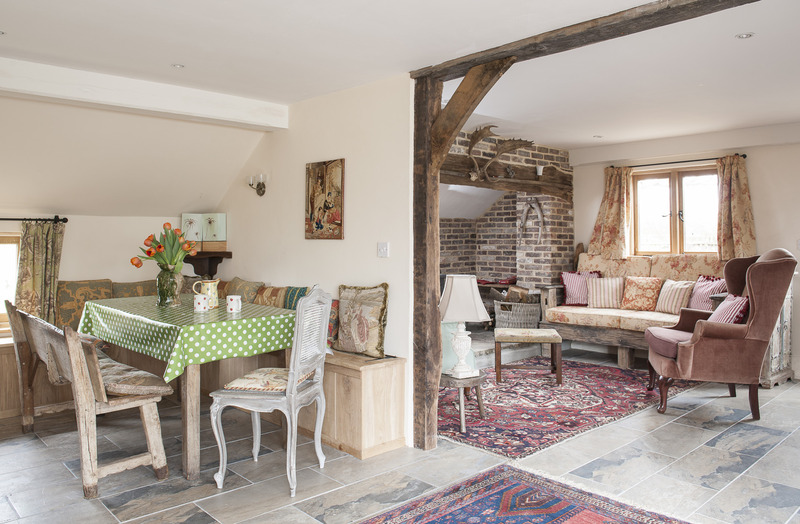 The sloping ceilings at the end of the garage were not high enough to walk under but the space couldn’t be wasted and Caroline hit on the inspired idea to put in an inglenook that runs the full width of the room and is now home to a woodburner. 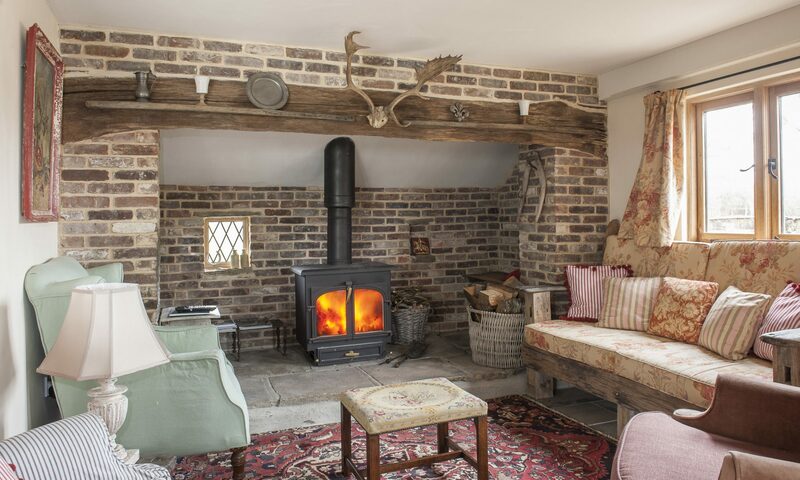 “I went to Symonds Salvage in Bethersden and found an enormous bressumer to carry the front bricks of the fireplace and used narrow French bricks to make it look more authentic,” she says. In a corner is a pretty, distressed Indian hardwood cupboard Caroline found in an antique shop in Wantage and over the kitchen surface at the other end of the room a corner cupboard which Caroline distressed herself in a pale green. She removed the doors to show the serpentine shelves and papered the interior. And so beneath a support made from more reclaimed oak into the hallway/dining room. 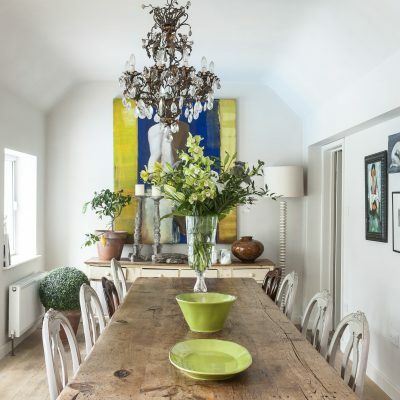 At one end is a dining table flanked by a banquette and a truly superb 16th/17th century backed bench. 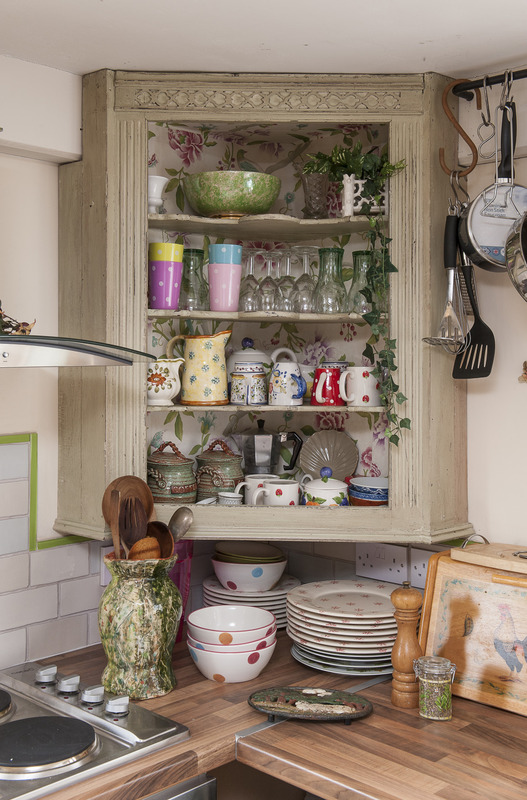 By the front door is a dresser that started life just as a couple of cupboard doors Caroline found at Symonds Salvage. She then designed the dresser around them and Colin Smith made the remainder from MDF. 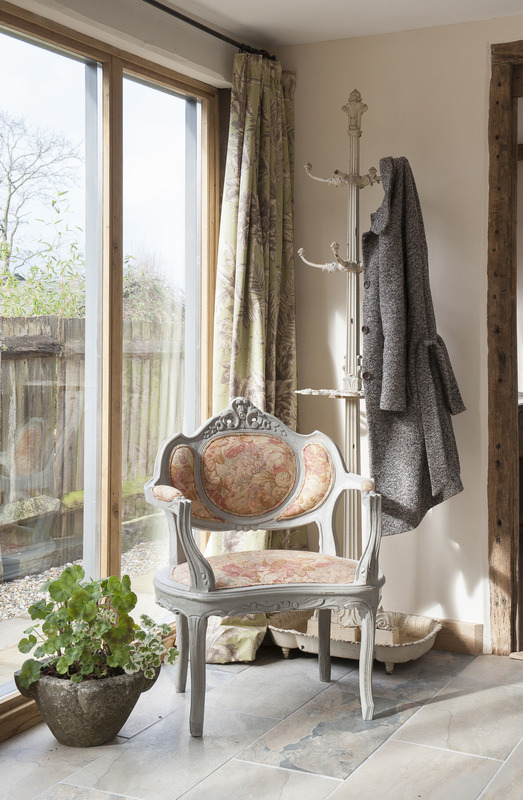 Caroline distressed it in a pale blue and the finished article now looks, even to an experienced eye, as if it has just been extracted from a French farmhouse. Opposite is a magnificent and unusual cast-iron hat stand from the Wish Barn Antiques in Rye. 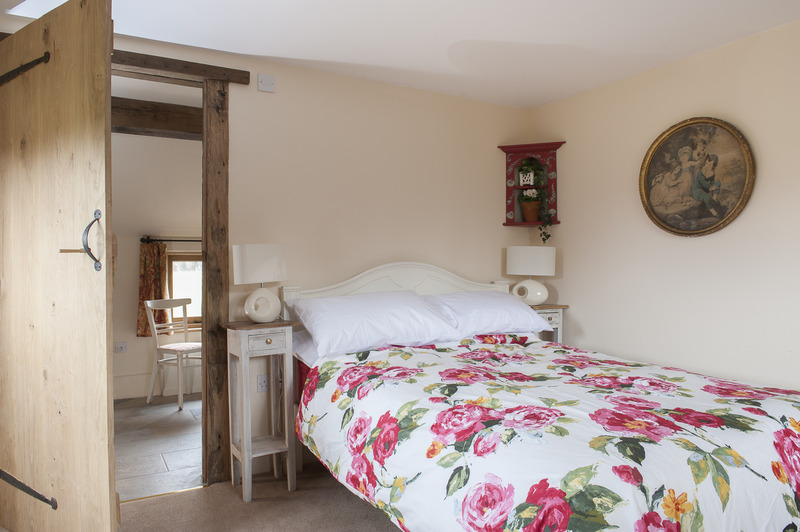 Across the hall and into the third space is the main bedroom and en suite bathroom. 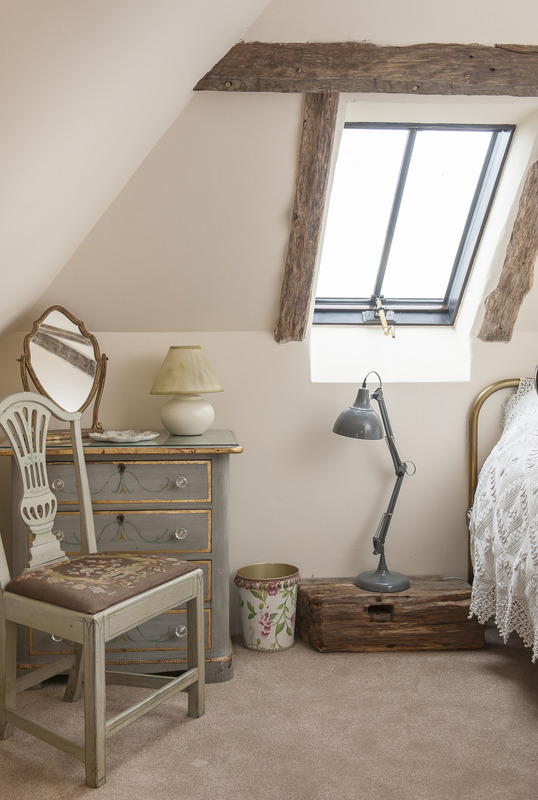 By the window stands a cream, distressed, red-leather-topped writing desk from Rising Star in Tenterden and, opposite, a double bed with a bold red-flowered duvet from John Lewis. Two dining chairs have been painted white and recovered in more Beaumont & Fletcher while on the wall is a corbel – one of a pair from Symonds Salvage and above it a large porthole window mirror. The old, oak-doored, built-in cupboards are spacious enough to conceal a regiment of foot. 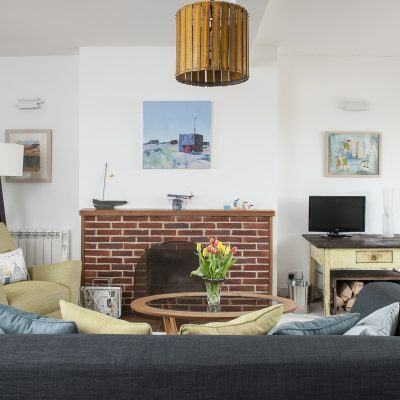 “Just because you’re on holiday it doesn’t mean you don’t need storage space,” says Caroline. 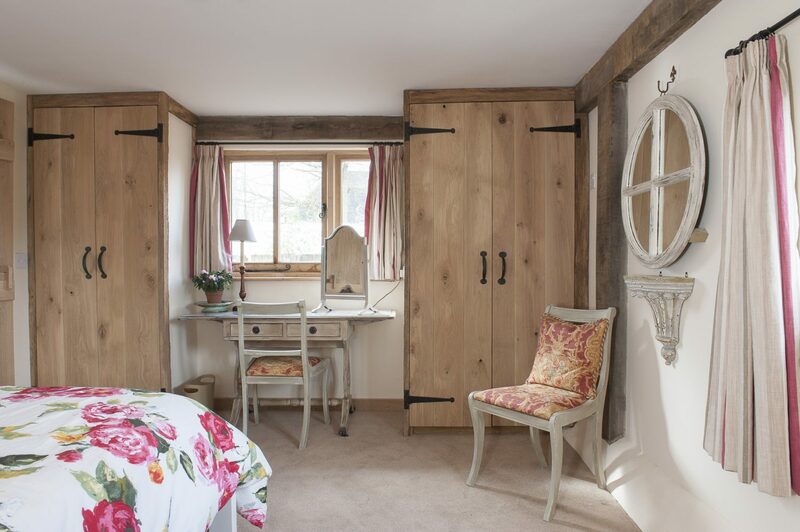 The corner cupboards are from the Antique Barn in Bethersden and bedside tables from The Merchant Chandler in Tenterden. In the elegant shower room both the shower and floor are the same Bengal Autumn tiles as the hallway. The mirror over the basin is a lovely little gothic shuttered window. This she did by creating a ‘medieval office wall’. At one end of the wall is an arched alcove in which has been fitted a pink marble-topped desk for visitors’ laptops. 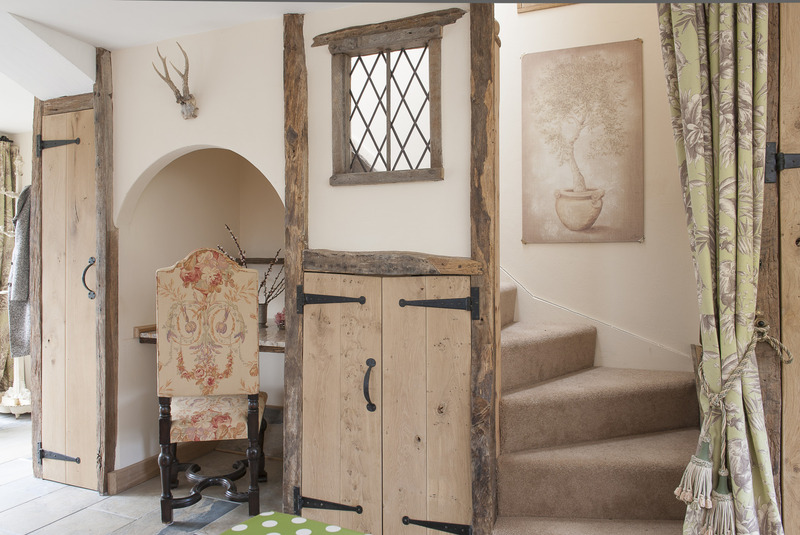 Next to it is a cupboard with oak doors, and a leaded light through to the stairs, both framed in old oak timbers. 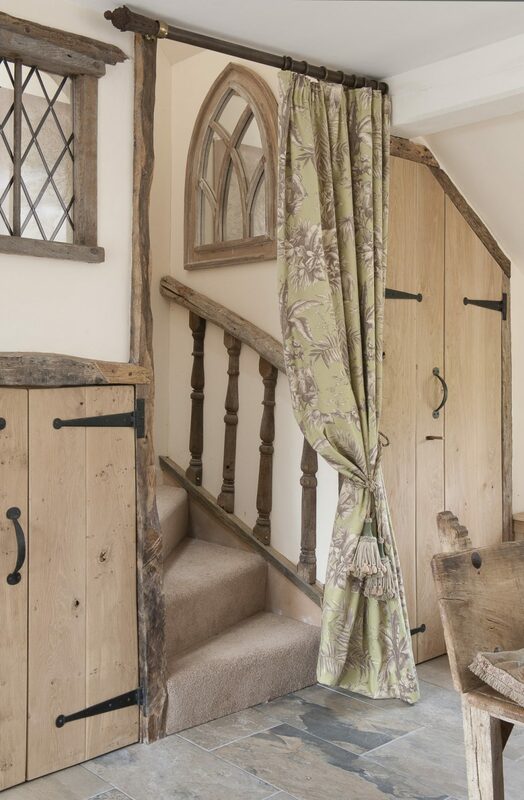 The stairway is also framed in ancient oak and climbing up the first few steps are oak spindles left over from the grand reclaimed staircase that now graces her own barn home. 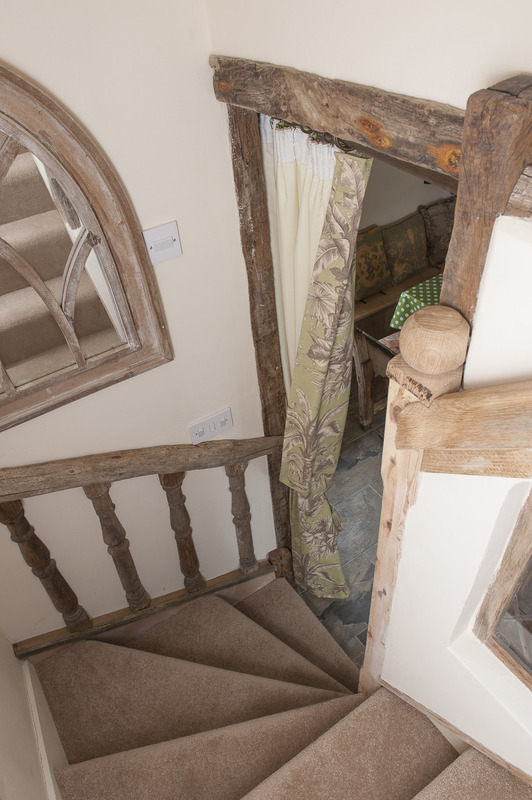 Above the spindles is a gothic window mirror. 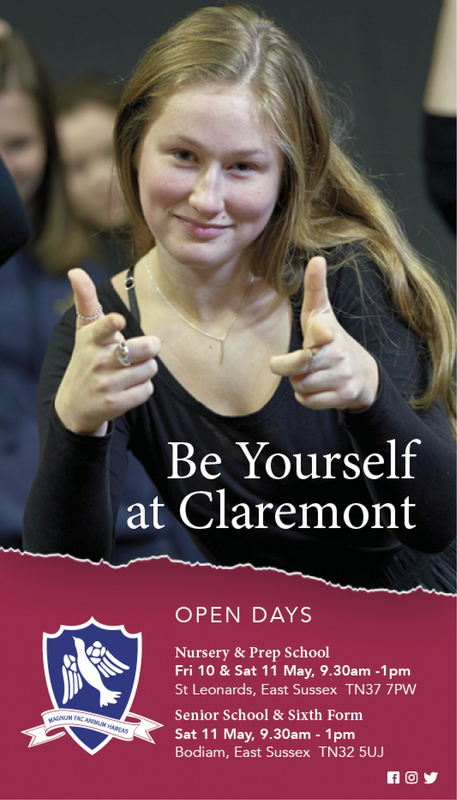 It really is a great – and fun – solution to an age-old problem. 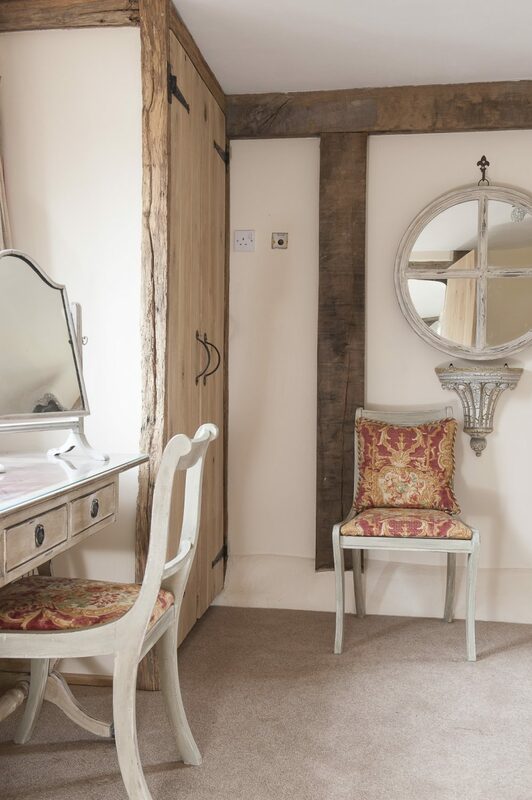 The bedrooms – a single and a twin – are lovely with superb reclaimed oak timbers that do indeed make you think you’re high in the attic of a barn. A serious find from the Hospice in the Weald shop in Cranbrook is a chunky and unusual brass bed and excellent mattress that cost a silly £60. 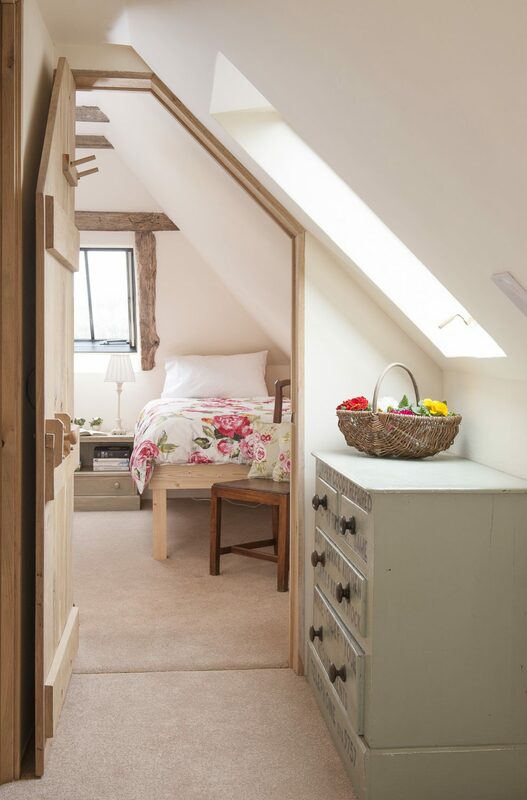 In addition to the aesthetics of the rooms there are also a couple of nice practical touches – the stealing of light from the stairway through an interior leaded light window and the disguise of the mandatory escape step up to the windows – in one room Colin has built a sturdy stepped bedside table and in the other simply laid a nice chunk of old oak. Outside, the exterior walls have been clad in pine weatherboarding and there is a pretty patio with views over the surrounding fields and encircled by a reclaimed oak fence, rescued from a friend’s bonfire, and a warm mixed media stone and brick wall. Just how Caroline has got so much out of so little in terms of space alone is extraordinary. How she managed to create quite such an attractive home for her guests is, quite simply a question for the gods.